WASHINGTON (CNS) -- 2018 will no doubt be remembered as a dark time for the U.S. Catholic Church. Catholics felt betrayed by church leaders accused of sexual misconduct and cover-up revealed this summer and this cloud still hung over the church at the year's end. In June, allegations were made against then-Cardinal Theodore E. McCarrick, retired archbishop of Washington, accused of sexually abusing a minor almost 50 years ago and having sexual contact with seminarians while he was a bishop in New Jersey. A month later, Pope Francis accepted Archbishop McCarrick's resignation from College of Cardinals and suspended him from public ministry, ordering him to a "life of prayer and penance" until the accusations against him were examined in a canonical trial. The archbishop, who has denied the allegations, now lives in a Capuchin Franciscan friary in Victoria, Kansas. 2018 will no doubt be remembered as a dark time for the U.S. Catholic Church. Since these allegations came to light, Catholic laity and church leaders, including bishops, have been asking who knew about the archbishop's alleged misconduct and how was it possible for him to move up the ranks in church leadership. Open letters to the pope asked him to investigate what happened and a fury of speculation was fueled by unsubstantiated allegations made by Archbishop Carlo Maria Vigano, former papal nuncio to the United States, who accused the Vatican hierarchy and Pope Francis, in particular, of being complicit in covering up accusations against Archbishop McCarrick. Amid church turmoil over Archbishop McCarrick, the church was dealt another blow in mid-August with the release of a Pennsylvania grand jury report covering 70 years of abuse allegations in six of the state's Catholic dioceses, starting in 1947. The report detailed allegations of abuse by 300 clergy and other church workers and involving 1,000 minors. It also claimed a church cover-up of abuse in some instances. The report particularly shined a spotlight on Washington Cardinal Donald W. Wuerl in reporting a mixed picture of how he handled some abuse cases when he was Pittsburgh bishop from 1988 until 2006. Amid renewed calls for the cardinal to resign, Cardinal Wuerl, who had submitted his resignation two years earlier after he turned 75, as required by canon law, met with the pope about stepping down. Pope Francis accepted his resignation in mid-October, while keeping the now-78-year-old prelate on as apostolic administrator for the Archdiocese of Washington until a successor archbishop is named. Another result of the Pennsylvania grand jury report was that 13 states and the District of Columbia announced their own investigations into church records. Several dioceses also started publicly releasing names of priests credibly accused of child sexual abuse, with most allegations decades old. Although the Pennsylvania grand jury report fueled strong outrage, it also raised questions about its intentions, especially since it focused on what happened decades ago rather than on the changes in church protocols on addressing abuse that have occurred in more than two decades, said Frederick Thieman. The former U.S. attorney for western Pennsylvania has served on the Independent Review Board in the Pittsburgh Diocese for 20 years. While a full accounting of child sexual abuse "is a story that needs to be told," Pennsylvania's use of grand juries that publicly disseminate accusations, but bring no indictments, can be problematic, he told the Pittsburgh Catholic, diocesan newspaper. "Unlike a trial, there is no opportunity for cross-examination and very limited opportunity for those accused to challenge evidence or present evidence of their own," he added. But as this process is more closely examined, the public shaming of Catholic Church leadership has already been in full swing. Catholics across the country, many of whom thought the church dealt with abuse 16 years ago after the Boston Globe highlighted the issue, expressed raw frustration and anger at listening sessions throughout the summer and fall asking church leaders what went wrong and how the church could move forward. As this process is more closely examined, the public shaming of Catholic Church leadership has already been in full swing. Catholics also gathered in cathedrals and parishes across the country for healing Masses said by bishops who have often prostrated themselves before the altar in a posture of repentance. Several bishops individually issued statements on the crisis and many urged Catholics to pray and fast for the church to find healing and restoration. In mid-September, Cardinal Daniel N. DiNardo of Galveston-Houston, president of the U.S. Conference of Catholic Bishops, had a long-awaited private meeting with Pope Francis at the Vatican to discuss the growing sexual abuse crisis in the United States. Between Aug. 1 and that Sept. 13 meeting, the cardinal issued five statements responding to various aspects of the sexual abuse crisis and called for greater transparency and accountability in the church, particularly on the part of the bishops. In early October, while they were in Rome for the Synod of Bishops, Cardinal DiNardo and Los Angeles Archbishop Jose H. Gomez, USCCB vice president, had a private meeting with the pope, again about the abuse crisis. 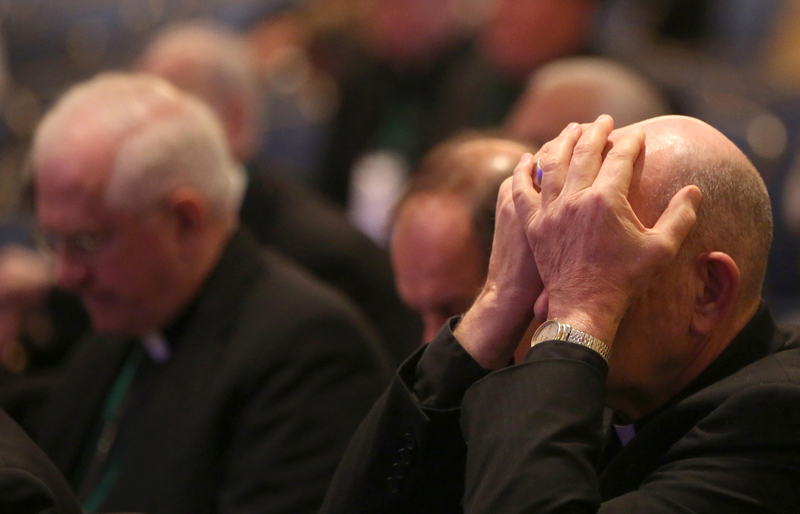 Abuse was a major focus of the bishops' June meeting in Fort Lauderdale, Florida, as well as at subsequent meetings of their Executive Committee and Administrative Committee. The issue also was front and center at the bishops' annual fall assembly in Baltimore Nov. 12-14 where protesters, including abuse victims, gathered outside. If a priest is ‘credibly accused’ of sexual abuse, what does that mean? Depends whom you ask. The meeting, which many hoped would be a decisive response to the abuse crisis in the church, began with an announcement by Cardinal DiNardo that the Vatican wanted the bishops to delay any vote on new procedures in response to clergy abuse until after a February meeting with the pope and presidents of the bishops' conferences around the world focus on the issue. The Congregation for Bishops, which made the request, also said the delay was needed to better evaluate the bishops' proposals in light of canon law. So instead, the bishops heard details about establishing standards of episcopal accountability; forming a special commission for review of complaints against bishops for violations of the accountability standards; and establishing a protocol regarding restrictions on bishops who were removed or who resigned over claims of sexual misconduct made against them or for grave negligence in office. And the end of the meeting, Cardinal DiNardo said he was more hopeful than he was at the meeting's start. "We leave this place committed to taking the strongest possible actions at the earliest possible moment," Cardinal DiNardo said. "We will do so in communion with the universal church." He said the discussion throughout the meeting provided direction and consensus and also would serve as a "springboard for action." Since the Baltimore gathering, more dioceses have publicized list of priests accused of sexual abuse of minors. On Dec. 6, the Archdiocese of Los Angeles released an updated list that included two cases of alleged abuse of current minors in the archdiocese since 2008. In remarks posted on the archdiocesan website along with the listing, Archbishop Gomez said that "every case of child sexual abuse is one too many, a crime committed against an innocent soul, a sin that cries out to heaven for justice, reparation, and healing." He called for continued vigilance but also noted that "we have witnessed a dramatic reduction in incidences of abuse over the last two decades." I am commonly to blogging and I really value your content. The content has truly crests my concern. I am going to bookmark your site page and keep up checking for new subtle basics. I am looking for some great blog locales for studying. I was seeking over web indexes and found your blog webpage. Well I like your top notch blog webpage design in adding up to your posting skills. Go on doing it. Thank you and good luck. Your blog have pleasant info I got smart thoughts from this amazing blog. I am constantly searching like this sort blog post. I trust I will see once more. The increasing of essay writing task will make students to feel lazy in these writing works. The academic’s essay writings are not that much very easy like any other tasks. It requires more knowledge and studies on the subjects. Students can never simplify their essays due to its having more important in the academy. So they cannot simply skip these writing for any reason. Some students feel struggle when they getting essay writing works in academy. The main thing is that the essay is having many rules for completing. Therefore students have to obey the rules to complete in a format. These factors are forcing students to buy essay from online services. There are number of service is providing well support for students writing tasks. Therefore students must need a best essay writing service to complete their essays. This essay writing service understands the students writing requirements and giving supports as per the requirements. Here I can sure that you can believe this company, ones you go through this best essay writing service link. One thing is sure they are not being to making profit without giving enough service. So go through this service for understanding it easily and quickly.